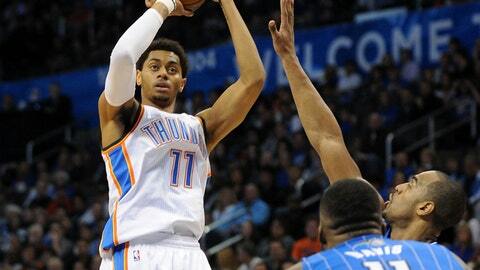 Oklahoma City Thunder shooting guard Jeremy Lamb (11) attempts a shot while being defended by Orlando Magic power forward Glen Davis (11) during the third quarter at Chesapeake Energy Arena. Let’s face it, the Thunder slogged through Sunday. Hard to get too excited for 7-16 Orlando. Can’t get up for every game, right? After all, the Thunder hadn’t played a bad game since early November. They were due. And they were also still good enough to beat the Magic, 101-98. I’ve been holding out, but no reason to any more. Lamb has proven, at least for now, the Thunder weren’t left with nothing after Kevin Martin bolted to Minnesota. Lamb didn’t get a lot of playing time last year, but he’s come off the bench and paired with Reggie Jackson to provide a pair of guys who can go get their own shots. Plus, Lamb’s length makes him a viable defender. Sunday against the Magic, Lamb was 7-of-10 for 16 points and no turnovers in 23 minutes. In the past four games, Lamb is 19-for-38 from the field, has scored 11 or more points in all of those games and has a total of five turnovers. He’s played at least 21 minutes per game in that same span. I’d say that’s a legitimate trend. But more importantly, the trend gives coach Scott Brooks options. Jackson and Lamb and Collison allow for the Thunder to be more diverse. It also frees Brooks up from getting set into a pattern. Now, to be fair, that pattern became a routine because Brooks always went to James Harden off the bench and then always went to Kevin Martin off the bench when Harden left town. No more routine for Brooks. He can mix and match depending on the situation, or go with the hot hand. Lately for OKC that has been both Jackson and Lamb. Anyone notice Durant missed the first of two free throws in the closing seconds, before making the second one. The miss gave Orlando the chance to go for the game-tying shot. Sorry for the bad news. Apparently there were some words from the Magic bench, too. Durant made that second free throw with 13 seconds to go, he and Soloman Jones started yapping at each other. Durant did end up with 28 points on 11-of-18 shooting. Durant is 21-of-31 the past two games for 59 points. Make it 12 in a row for the Thunder, best streak Oklahoma City has even had to start the season. Overall, the Thunder have won 14-of-15 games and that included a pair of road back-to-backs in the past two weeks. I don't know what these ref's have against my baby….he's the sweetest little thing ever…. Ahead by double digits most of the game, Orlando got within two points and had a chance to tie the game in the closing seconds. It didn’t help that OKC had an 18-point fourth quarter, limping to the finish. The game was never in doubt until it was. Lemme explain. It sure didn’t seem like the Thunder had any chance to lose, but in the final moments, "We didn’t do a good job of executing down the stretch," coach Scott Brooks said. He was referring to the fact the Thunder nearly blew a 10-point lead in the final two minutes. "I think focus was definitely lost. It’s something we have to remind ourselves that there’s 48 minutes of basketball. We turned it over. We didn’t get good shots and we didn’t get back on defense. We knew they were going to play hard." The good news was that Orlando seemingly tried to get Jameer Nelson or Aaron Afflalo a look on the final possession, but it didn’t work. Instead Glen Davis missed an off-balance, 25-footer. "I just had to throw it up," Davis told Orlandomagic.com. "I’ve been pretty lucky lately with those, but I guess my luck ran out." 2. What happened to Serge? Nikola Vucevic had an impressive 13 points and 16 rebounds. He went six-of-nine from the field He was good, but he’s not better, in any way, than Serge Ibaka. So what happened to Serge? He had four points and two rebounds in just 20 minutes. It was the first time in 13 games Ibaka didn’t score in double figures. For a guy like Ibaka, who has really found his touch offensively this season (15 points per game, 9.8 rebounds) Sunday was kind of a surprise. Ibaka started the season by scoring less than 10 points in the first three games. He has had just two games since where he’s been held under 10. Can’t imagine his performance against Orlando will turn into a trend. So what’s the team temperature heading into the week? Hard to really process this, but the Magic actually cooled the Thunder down. Yeah, I know. Sounds weird, doesn’t it? After blowing out the Lakers and winning at Atlanta and Memphis, the Thunder were playing their best basketball of the year. Mix in a romp over the Pacers last week, too, and it was clear. However, even the good teams lay a big egg every once in awhile. Sunday would definitely count as that for OKC. However, the Thunder are hot.